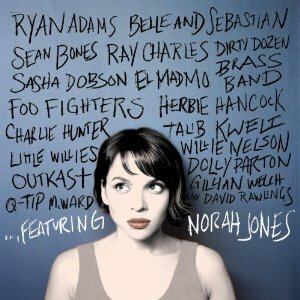 Norah Jones has a new cd in stores now ...Featuring Norah Jones ! She does cameos, collaborations and duets with a wide range of artists including Foo Fighters, Q-Tip, Ray Charles, Outkast, Willie Nelson and more. All 18 songs on this cd include another artist. Honestly, Norah Jones is not something I would normally listen to. I am more into harder rock, alternative and punk. However, I like to "broaden my horizons" and listen to all types of music. I also like a few songs that Norah Jones has done in the past and I was excited to see how the songs came out with people I love like the Foo Fighters. So, I decided to check it out. I am amazed at how soft Outkast and Foo Fighters and some of the other collaborators are in their songs on this cd. I never would have known it was them if I wasn't holding the cd cover. I was kind of disappointed by this. I think the songs would have been more complex and interesting if the other artists had kept their style and mixed it in with Norah Jones. Instead, they seemed to conform to her style of soft music. This cd is very mellow and soothing. It has some great songs on it. My favorite is actually Bull Rider with Sasha Dobson (whom I have never heard of). The song has a great rhythm. Overall, this cd is not really my thing. I feel like a lot of the songs sound very similar and Norah Jones' voice doesn't seem to very throughout the cd. However, if you like Norah Jones or softer music you will love this cd! Disclaimer: I received the listed product(s) in exchange for this review from the One2One Network. I was compensated in no other way. The thoughts here are my own honest opinions.